Last night I drove to Syracuse to see my beautiful and talented friend Janet Engle in her Redhouse debut. I’d never been to The Redhouse Arts Center, and I was impressed. The spacious lobby had a funky coffee shop feel, with an acoustic band in one corner and a cafe that was open before the show, at intermission, and again after. They served wine, draught and bottled beer, milkshakes(! ), appetizers, sandwiches, and baked goods. The staff was friendly and helpful. The main theater space epitomizes “intimate” – I could become addicted to watching productions mere feet from the performers. The seating is on a steep angle, and I had no trouble seeing from the back row (where I was still less than 20 feet from the action.) Before the show, video features and announcements played on a lowered screen – a brilliant idea that I haven’t seen before. The group is moving to new quarters in 2015, and I hope they maintain what’s so charming about the current space, which is pretty much everything. About the show. I was unfamiliar with A Man of No Importance, a musical comedy about an amateur Irish theater group in 1960’s Dublin and their attempt to mount Oscar Wilde’s Salome. So it’s a musical comedy about putting on a tragedy. The production began in front of the curtain, with Father Kenney offering scant consolation to Alfie (Michael Pine) in the aftermath of what seems to have been a minor scandal. The lighting is dingy and the mood morose – I worried we might be in for a long evening. Then the curtain opened on the ensemble, with orchestra scattered around the upstage, and they made my hair stand up. The full cast numbers in this show were powerfully sung. From that point on, it was a brisk and enjoyable evening. Stephen Svoboda’s direction made inventive use of relatively limited stage real estate, not only packing a large cast and pit band on stage, but moving them through many virtual settings by reusing trunks and chairs (set design by Tim Brown); some of the musicians also played roles. A minor quibble – sometimes when actors moved from one setting to another, they tediously walked in a circle around the stage. I would have preferred a more distinct lighting change, and less actual movement (trust the audience to get the transition.) Only one moment absolutely didn’t work for me, late in the second act when Alfie takes a beating. Perhaps the audience was too close for the stage fighting to really work, but it didn’t carry the impact it should have, and later scenes that referenced how terrible Alfie looked didn’t play well. A lesser complaint is a piece of staging late in Act II when the entire cast lines up downstage, lit from behind and silently facing the audience – I couldn’t figure out what it meant or why, which might only be me being obtuse. Scene changes were fast and mostly carried out by actors. Marie Yokohama’s lighting was chaotic and colorful at its best, and offered several striking moments that enhanced the drama. I sometimes wished for a breakup pattern instead of dim levels in certain scenes, and the LED footlights directed toward the audience were overused for my taste. Anthony Vadala’s sound design was excellent (I believe he also jockeyed the board), and the mixing of the actors’ wireless mics with the band was almost perfect, to my ears – I’ve rarely heard a better live sound mix in a stage musical, anywhere. Michael Pine is amazing. He’s in almost every scene (he also plays Oscar Wilde in Gross Indecency, showing on alternate nights.) I was told later that Pine had suffered the flu all week – he made it work for him. As the titular “man of no importance” and stand-in for Wilde himself (who appears several times as a hallucination – wonderfully abetted by sound and lights) we need to care about Pine’s Alfie or the entire show goes limp. Based on the tears of those around me near the end, he nailed it – the standing ovation was well-deserved. Get your tickets to this show – I thoroughly enjoyed my evening. Patrick Burns’ orchestra was great, and the ensemble was given individual moments to shine throughout the night. My only regret is that I didn’t reserve seats for Gross Indecency ahead of time. 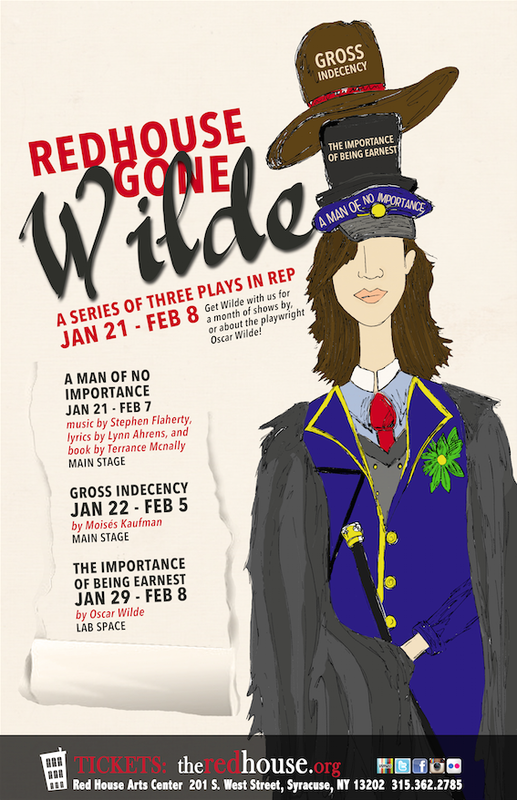 The Redhouse is doing some very interesting theater, and I can’t wait to go again. Posted in Theater and tagged Theater Reviews. Bookmark the permalink.